SimWalk Version 5.0 now released ! With SimWalk 5.0 Savannah Simulations AG, the developer of SimWalk, makes a major leap forward into the future of pedestrian simulation technology. Version 5.0 includes a high-accuracy, next generation pedestrian algorithm, delivers high-end performance through parallelization and cloud integration, a completely overhauled user interface, targeted for ease-of-use, and better analytics than ever. The new SimWalk 5.0 algorithm adds real-world way finding intelligence to pedestrians through a new and advanced heuristic route choice model. Pedestrians intelligently calculate their way by a heuristic mix between shortest path and shortest Performance up to 100‘000’ and more pedestrians in reduced time, depending on the available CPUs in use. The new SimWalk 5.0 algorithm adds real-world way finding intelligence to pedestrians through a new and advanced heuristic route choice model. Pedestrians intelligently calculate their way by a heuristic mix between shortest path and shortest Performance up to 100‘000’s of Pedestrians distance to the destination, by congestion avoiding and considering comfort factors (e.g. a person with a wheelchair avoiding a stair). Pedestrians find their way realistically by balancing their planned activities (e.g. ticket buying, coff ee shop, rail trip) with the route choice model. The completely overhauled graphical user interface of SimWalk 5.0 improves the speed and learning curve for conducting pedestrian simulations in a major way. 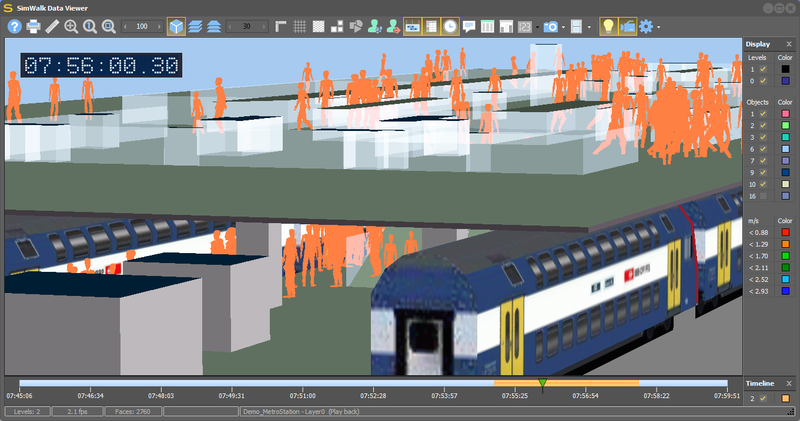 The interface is based on and optimizes the basic workflow for pedestrian simulation. It guides the SimWalk user step by step through the simulation process and controls the validity of every step. The integrated tool SimWizard supports the user with every step, from model set up to the final analysis. The new cloud accessibility of SimWalk 5.0 delivers scalable calculation performance for every project need, from platforms to stations to cities. Depending on time constraints and budget, the user decides for the optimal performance that is needed for the task. In addition, the cloud off ers new services like SimWalk-360 the permanent station model.